Okay, so it’s a Christmas themed indiepop tuned, or at least related to the holidays. 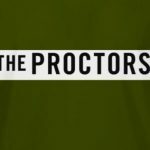 Still, The Proctors made my Best of Indiepop, and here they are not a day later sharing this joyous tune. It’s a slow moving affair, more about the storytelling and the warmth of the melody than anything else. The tambourine feels like jingle bells, and there’s this fuzz on the mix that feels like snow falling from the skies. We’re not far away from holiday season, as my wife’s living room decorations can attest, so why not get in the mood with a nice slice of drifting indiepop from one of the genre’s finest.